If you haven’t yet, you probably should read The New Yorker‘s recent exposé on Scientology, which focuses on former member Paul Haggis, a writer and director. Scientology has a reputation of being really frightening, and I’m inclined to think the Church itself encourages this. It’s quite different from how most mainstream religions try to present themselves as open and accessible. As reported by ex-Scientologists and documents cited in a court case against the Church, the core of their belief system is something like this. Basically, seventy-five million years ago, this portion of the galaxy was ruled by an alien overlord named Xenu. 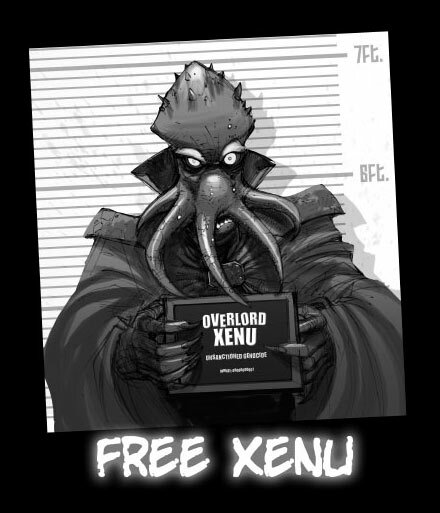 In an attempt to end overpopulation, Xenu had his less loyal subjects rounded up, paralyzed with a mixture of alcohol and glycol, and thrown into volcanoes on the planet Teegeeack, which is what Earth was called in those days. (No idea whether the G is supposed to be hard or soft.) He then had the volcanoes detonated with atomic bombs, releasing their souls, which then began clinging to people and ruining their chances of achieving true greatness. These are “body thetans,” while the way to salvation is to remove these and activate the powers of your own soul, which is apparently also called a thetan. Xenu is still alive in a mountain prison protected by a force field. Strange that alien beings living in the distant past had such similar culture and technology to our own. I’d say this is bad science fiction, but since I can’t find a shred of science in it, I guess “space opera” is more appropriate. The thing is, Scientologists deny that they teach this, and apparently only show this story to initiates once they’ve progressed pretty far into the organization, and are so messed up that they’re willing to accept just about anything. It’s called “Scientology,” which, as I’ve seen mentioned recently, sounds like a name made up by a child. And it’s based on a book called Dianetics, which based on the name apparently isn’t producing sufficient insulin. Admittedly, I’ve made up names just as ridiculous in my own writings, but I’m not trying to convince anyone they can achieve enlightenment by following the tenets in them. Even if you like a celebrity, though, why would you have to believe what they do? It’s apparently a religion intended for people who unironically read supermarket tabloids. The Church isolates its members from all outside influences, which should automatically be a red flag. As mentioned in the article, this is something they share with the Amish and some Orthodox Jews. Then they have the audacity to claim that they want you to respect dissenting opinions. How can you respect them when you don’t even know what they are? They’re officially homophobic. Okay, actually, a spokesman for the Church claims that the homophobic references in L. Ron Hubbard’s work were inserted by someone after Hubbard’s death, and they’ve since been edited out. Except they haven’t, and the Scientologists came out in favor of Proposition 8. Perhaps most significantly, the whole thing was founded by a guy who said starting a religion was the best way to make money. Lafayette Ronald Hubbard was born in Nebraska in 1911, and spent most of his childhood in Montana. He served in the Navy during World War II, and reported that he was injured and combat and healed his own wounds with the power of his mind. He studied civil engineering at George Washington University, but dropped out after two years. He made a career in writing pulp science fiction, often writing under pseudonyms. I’m not sure when he started using “L. Ron,” or whether there’s any connection with Elrond from The Hobbit and Lord of the Rings. I’d rather have a half-elf than a freaky old American Idol judge as my father. I’d say he thought the “Lafayette” was too pretentious, but obviously somebody who starts his own religion isn’t all that concerned with being seen as pretentious. I also have no idea how he was as a writer. I’ve heard that he was pretty good but not one of the greats, although what I know of the Xenu story and the plot of Battlefield Earth certainly don’t sound like anything worth non-ironic reading. His friend, the rocket scientist John Parsons, introduced him to the world of black magic, and there’s a story about the two of them trying to impregnate a woman with the Antichrist. I believe Hubbard also met Aleister Crowley himself, although it would have been quite late in Crowley’s life. While Hubbard went on to deny that he was a practitioner of black magic, instead insisting he was a spy trying to infiltrate the movement, I get the impression that there’s a fair amount of the occult in the religion he created. I mean, part of it is healing wounds with the power of your mind (which I guess would actually be white magic, wouldn’t it? 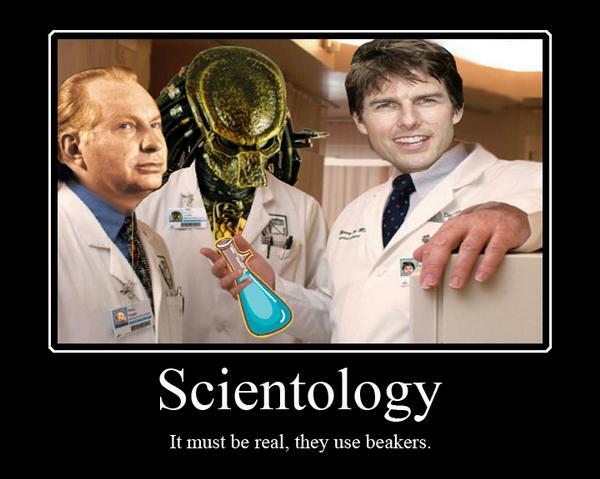 ), and Operating Thetans are supposed to be able to move objects without using their bodies. I find it interesting that Haggis says he was an atheist when he became a Scientologist, and while he was skeptical about the Xenu stuff, he was apparently okay with mental magic. Personally, I put that in the same “no evidence” category as I do gods, the main difference being that gods are usually more interesting. Well, magic is also interesting, but the wizardry of fantasy books that operates according to in-universe rules is a lot more fun than the dull “you can’t prove it didn’t happen” sort of magic associated with the New Age movement. And Scientology seems to be pretty firmly entrenched in the New Age mode of thought, where everything is about mind-cure and realizing the amazing potential of the human brain. 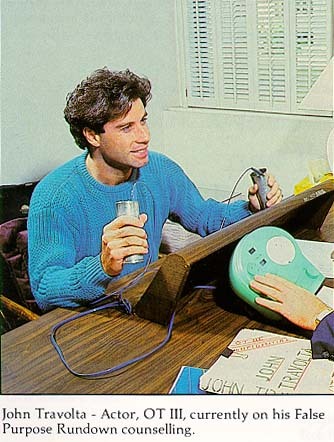 What, I can’t work magic unless I’ve been indoctrinated with crap about thetans and how psychology is evil? Harry Potter never needed to go through that! By the way, the reason Hubbard was so against psychology and medicine was apparently that they wouldn’t accept what he made up off the top of his head as worth any actual study. He insisted that psychiatrists secretly want to kill everybody, which sounds rather unlikely, as that would leave them without any patients. In his later years, Hubbard spent his time driving around in a mobile home, and died of a stroke in 1986, with his adherents insisting that he’d just moved on to another plane of existence, leaving his body behind. While the Church of Scientology didn’t want the medical community to examine his body, they did anyway, finding high levels of the psychiatric drug Vistaril. Wow, a cult leader who’s a hypocrite? Who would have guessed? Anyway, his successor as leader of the Church of Scientology was David Miscavige, who still holds the position today. And if the article is to be believed, he’s both verbally and physically abusive. This entry was posted in Cults, Mystery Cults, Religion, Scientology and tagged aleister crowley, antichrist, battlefield earth, body thetans, david miscavige, dianetics, elrond, homophobia, jeffrey scott, john parsons, kirstie alley, l. ron hubbard, little miss muffet, muppet babies, operating thetans, paul haggis, teegeeack, the new yorker, vistaril, xenu. Bookmark the permalink. 11 Responses to What’s in Hubbard’s Cupboard? yes, I know he was full of it but I actually liked his book battlefield earth. I haven’t read anything of his. I’ve seen reviews of the movie that made it look really bad, but apparently the book wasn’t QUITE as stupid. I guess it’s always different when it’s YOUR religion, rather than someone else’s. 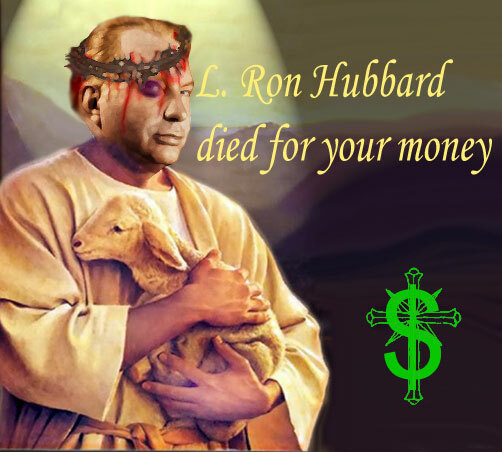 It is very sad indeed to see that some people had used Religion just for to make money, I wonder why scientology are so greedy , I think Religion should be a free gift for everyone.